We are proud to announce the opening of our Video Conference facility in Harrison, NJ. 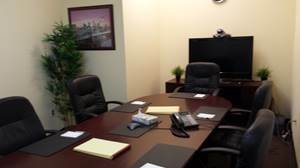 This-state-of-the-art video suite offers up to eight people the unique ability to participate in face to face depositions, meetings and interviews with other associates throughout the world. We are conveniently located minutes from Newark Airport, Penn Station and the Harrison Path train. Our facility offers, water/coffee, Wi-Fi, copy services, fax machines, projectors, white boards and more. Catering and transportation provided upon request. Additionally, we are affiliate members with three of the largest and most reputable networks of video conference rooms in the United States and abroad. As such, we can arrange rooms anywhere you need one or more and you will be the beneficiary of our affiliate membership discounted rates. No Travel, No Downtime, No Stress! Videoconferencing is a widely used and cost-effective alternative to traveling out of state to conduct a deposition or interview an expert witness. Instead, stay local, save money on airfare and hotel accommodations and make use of your downtime. After all, time is money!